He suggested it would not benefit the country. 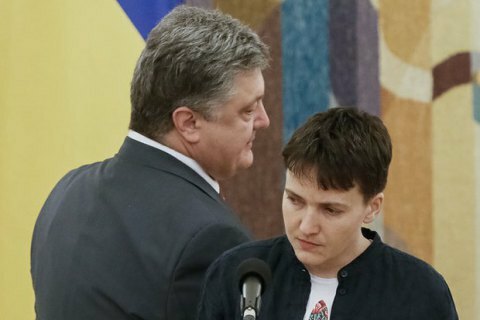 President Petro Poroshenko has disapproved of MP Nadiya Savchenko's negotiations with Oleksandr Zakharchenko and Ihor Plotnytskyy, the leaders of Donetsk and Luhansk militants respectively. "I deeply regret it because this person has suffered many hardships. And I think such steps would not benefit her or the country," Poroshenko said on a visit to Ivano-Frankivsk, according to Interfax-Ukraine. It took several days for the media to learn about Savchenko's secret meeting with the militant leaders in Minsk. On 12 December, Savchenko confirmed she had met Zakharchenko and Plotnytskyy. She said she saw them as "people, not devils".